Halberstam, Tovia and Joshua Halberstam. “The Blind Angel”, Toby Press, 2015. Storytelling has always been an important part of Chassidic culture. Important to these stories is the “tzadik”, the righteous man or woman who emphasized serving God through joy and the stories dealt with ordinary life. Many were about poverty and livelihood, illness and health, matchmaking and divorce ad of course sin and repentance and what awaits in the afterlife. For twenty-five years, Rabbi Tovia Halberstam, one of the leaders of the of the Chassidic movement, told riveting Chassidic tales to an audience of thousands on the Yiddish radio in New York. These legends were heard by many before the Holocaust and are rich in description in plot. They have been preserved today in their original Yiddish by the Chassidic community; the tales capture culture that is very much alive with animated characters, humor, wisdom, human struggle, and moral lessons. 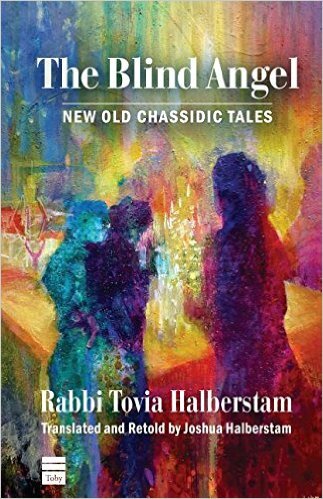 In The Blind Angel, Rabbi Halberstam’s son, Joshua Halberstam, renders these tales in English for a modern audience and he has been able to keep the full charm, rhythm, and authenticity of the original tales. As the author retells his father’s stories, we enter a world that is unfamiliar and intriguing to many. Not only do we get the wonderful wit of the rabbi but also Chassidic teachings and stories that are filled with emotion. Halberstam, the son, has managed to preserve the “religious sensitivity and folk tale tradition of the originals in the thirty-seven stories in this collection. This entry was posted in Judaica on October 31, 2015 by Amos.